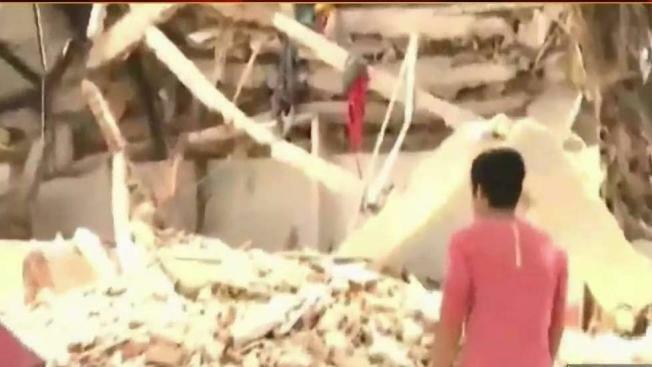 In many parts of Central Mexico, rescue efforts were just getting underway Tuesday after a 7.1 magnitude earthquake hit Mexico City earlier in the day, killing dozens of people. Those in the Bay Area with loved ones in the quake zone were desperately trying to get through to them with little success. The powerful quake reduced tall buildings to rubble, and reports surfaced of survivors trapped under tons of concrete. In many parts of the city of nearly 22 million, communications systems were virtually nonexistent. Aurora Perez stopped by the Mexican consulate in San Jose on Tuesday, trying to reach family in Mexico. But she couldn't get through. "I'm trying to call them, but nobody answers me," Perez said. "I do not know what is happening." Alejandro Sanchez, a taco vendor in San Jose, said he was finally able to reach relatives via Facebook Messenger. "One of my daughters has her data," he said. Other people were using the messaging service WhatsApp to communicate with loved ones in the disaster zone. The images from Tuesday's temblor are eerily similar to the big 1985 quake in Mexico City 32 years ago to the day. Many visiting the San Jose consulate, including some pageant queen contestants, wished they could help. "It's so sad to see, and I can't do anything," Bella Padilla said. "I can't be there with my people and help them." The flag at the consulate remained at full staff as their countrymen deal with yet another major disaster. Officials at the consulate have been in contact with the Mexican embassy and with the Mexican presidency to assess damage and needs. People searching for loved ones in the earthquake zone can call a hotline at the Mexican consulate at 1-855-463-6395.